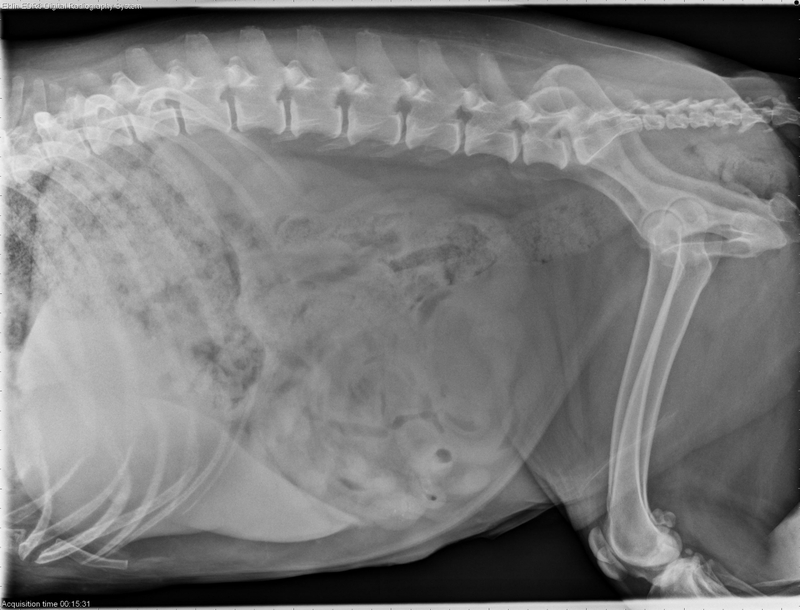 This week’s case is a 10 year old mixed breed dog with lethargy and inappetence. This case is challenging. See what you think of it and post in the comments. In the thorax, there is a diffuse mixed pulmonary pattern with miliary nodular and bronchial components. There are also alveolar infiltrates in the ventral portion of the left cranial lung lobes, best noted on the right lateral projection. There is ill-defined soft tissue opacity dorsal to the carina, which may represent lymphadenopathy. The cardiovascular structures are within normal limits. Within the abdomen, the liver is enlarged, causing focal poor peritoneal detail. 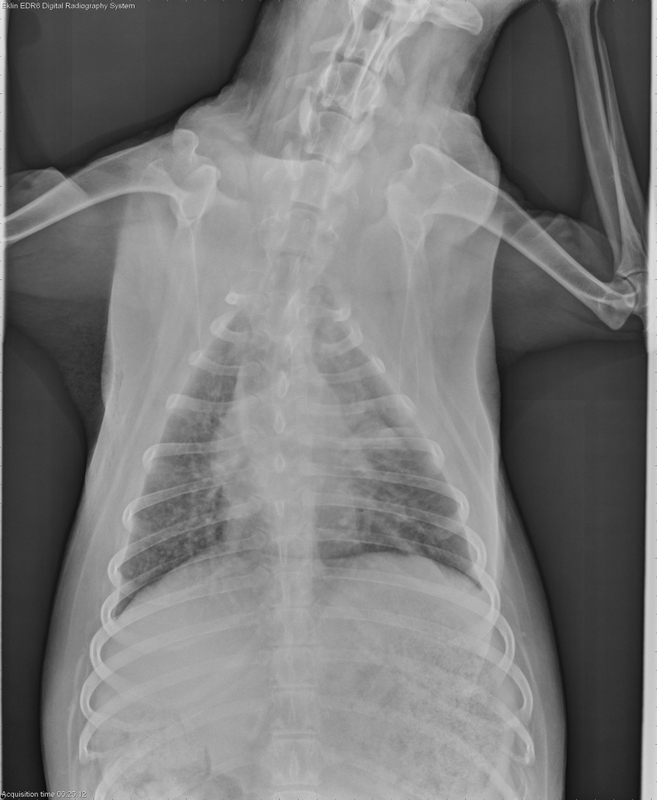 This dog had a positive titre for coccidioidomycosis. Pulmonary infiltrates are often nodular but can appear diffuse. 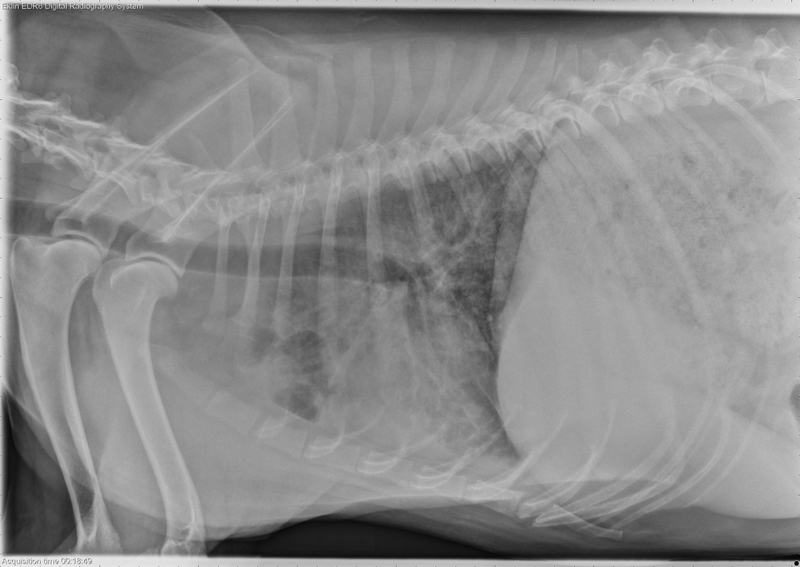 The ventral distribution of the alveolar component may indicate an additional secondary bacterial pneumonia. The hepatomegaly was presumed to be due to disseminated fungal infection. 1. Diffuse alveolar pattern with a micronodular/miliary component. 2. Poor serosal detail within the mid-abdomen with no evidence of a mass effect displacing any viscera. 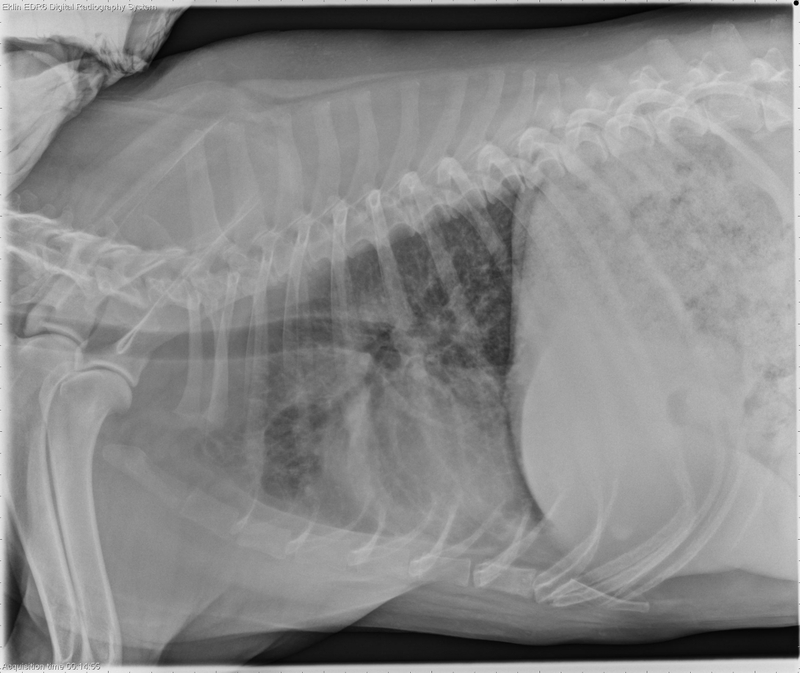 Differentials include mesenteric lymphadenopathy, abdominal effusion, or a non-obstructive intestinal mass. Suspect disseminated LSA affecting the lungs, tracheobronchial lymph nodes and liver and possibly abdominal lymph nodes (mesenteric)/intestines. Systemic fungal disease (histo, blasto, coccidio) should also be considered. Recommend abdominal ultrasound and biopsy of the liver and lymph nodes (if found enlarged). In the absence of any respiratory clinical signs, ARDS, severe chronic lower airway disease, interstitial lung disease, hemorrhage are considered unlikely. – diffuse interstitial infiltration in the overall lung field with micronodules in the right caudal lung lobe. – On image #2, an abnormal soft tissue density dorsal to the 2nd sternum, interlobar fissures, and increased radiopacity on the cranial 2/3 of the heart, which may be due to summation of the increased lung opacity. – Lymphosarcoma or Metastatic malignant neoplasia affects the lungs, the pleura, the sternal lymph node, the liver, sublumbar lymph node group, and the mesenteric lymph nodes. 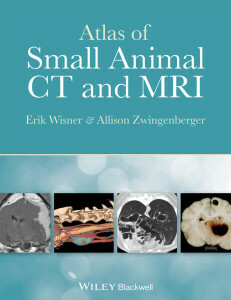 Recommend thoracic and abdominal ultrasound or CT scan and biopsies and aspirations. Nice job. I think the key things to think about in this case are differentials for a nodular pattern (it’s subtle), and that the abdominal involvement most likely indicates a systemic disease. In these types of cases I try to list differentials that encompass all the changes first, and then those that could cause the radiographic signs separately. The case is open now. This one was really challenging. On lateral view, there is a enlarged caudo-ventral liver lobe with caudally displacing gastric axis. The stomach is filled with homogenous opacity. The ventral lung lobes are mildly retracted with increased pleural space opacity. The thorax esophagus has small amount of gas delineating the dorsal portion of the trachea. There is an increased peri-hilar soft tissue opacity around the carina. The cardiac silhouette is obscured. Diffuse bronchial pattern on the caudal lung lobe is present as well as increased soft tissue opacity on the cranial cardiac silhouette. ON VD view, the lung parenchyma in the right hemi-thorax shows structured milliary nodular interstitial lung pattern. The angle of main stem bronchus are widened. The left cranial lung lobe has alveolar pattern with a lobar sign. 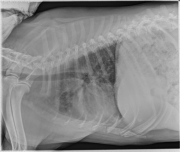 ON vd view – The abdomen is distended with the gas filled small bowel loops is located to the right abdomen. The large bowel is distended with feces. The head of spleen body and tail is in normal limits with sharp margin. The bladder apex is displaced to the left of the abdomen. 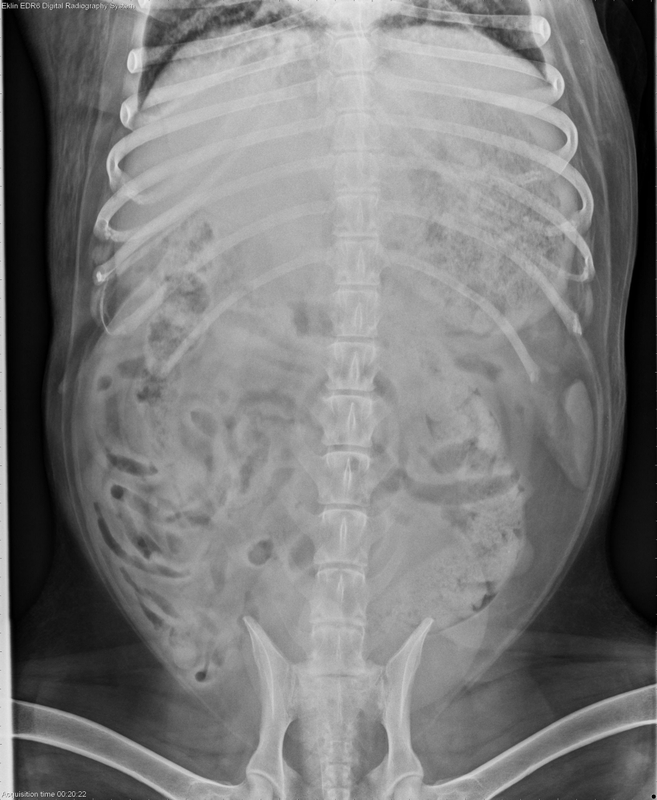 There are large fat tissue opacity is identified between the spleen and small bowels with poor serosal detail. Thorax – Pleural space with fat tissue opacity. Diffuse bronchial lung pattern on the caudal lung lobe with diffuse structured nodular interstitial lung pattern. Cranial left lung lobe is atelectasis with pleural effusion. Hilar lympadenopathy or mestastatic mass with the cowboy-legged main-stem bronchi. Abdomen – Moderate hepatomegaly with gastric axis change. 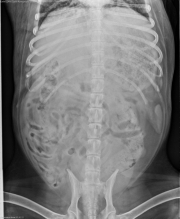 Enlargement of stomach with ingested food. The loops of small intestine filled with gas are displaced to the right, along with the normal colon filled with feces. The large fat tissue opacity is observed between the spleen and the bowels. Abdominal distention. Fat tissue opacity – lipoma or liposarcoma in abdomen. Nice job! I think the opacity in the left cranial lung lobe is alveolar rather than atelectasis and I don’t think there is pleural effusion. The fat in the abdomen often collects on the left side displacing the intestines to the right, so that is just normal fat deposition. For the liver, try to tie it into the thoracic disease if you can, it’s always good to try to give the animal one disease if possible! Thank Dr. Zwingenberger for checking out and pointing out the fat tissue accumulation on the left side of the abdomen.